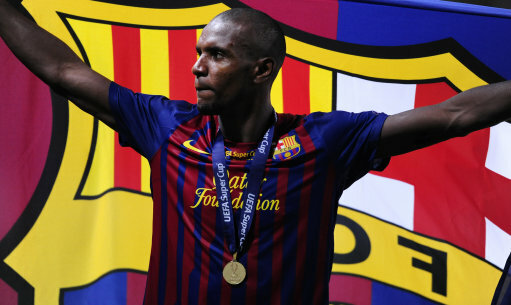 “In the coming weeks, Abidal will undergo a liver transplant, given the development of his liver illness. The transplant was an option as indicated from the start of treatment a year ago. The news comes an exact calendar year since Abidal was first diagnosed with having a benign tumour in his liver, a tumour he underwent successful surgery to remove several week later. He then made his playing comeback just 48 days later, coming on for an emotional cameo in Barca’s Champions League semi-final second leg victory over Real Madrid last year. As we said this time last year, best of luck and get well soon Eric. Pies are rooting for ya! how long will he be out after the transplant? must be a couple of weeks even months. i hope he makes it to the euros. Jeez, poor Eric. I had no idea his illness had got so bad & I hope he gets a suitable liver match. Abidal is emphatically not going to be at the the Euros & it’s unlikely he’ll be able to play professional football again. It’s that serious. As a Barca supporter I would love to see him back on the pitch for us, but as we all remember in times of sadness/tragedy, football is a small part of a big picture. Best wishes to King Eric on a speedy recovery.